Mike has been coaching leaders and teams for over 20 years. Everyone needs guidance, added focus and at times, they need to be held accountable. Mike’s personalized and tailored approach can support you and your team to increase business results. Whether it’s goal setting, time management or soft skill development, Mike can help. Mike Mack enhances your staff’s ongoing performance by challenging them to turn their soft skills into hard assets for your organization. His relationship-driven approach is tailored to support your businesses’ specific needs. By assessing your needs and ultimate goals, Mike Mack can help improve your company’s sales and overall customer experience. Mike’s experience and exceptional facilitation skills can guide any team in a planning session, a boardroom meeting or retreat. This allows you to focus “ON” your business and ensures your corporate priorities are aligned, with tangible action plans that help you realize results. Mike Mack will meet with your business to facilitate a complimentary discovery meeting in order to find out the concerns, opportunities and strengths that your business can leverage. Business Facilitation services are available to companies in all industries. Learn about Mike's Cohesive Business Solution. Making your team better is a must in our globally competitive marketplace. What skills does your team need to improve upon? Mike Mack has an extensive list of tailored training programs that can help your team on their development journey. Mike Mack will create tailored and branded training material for you that is a unique package to suit your business and to enhance employee engagement. He will facilitate roundtable style and interactive training to capture valuable insight from participants, enhance employee engagement and improve soft skill development. He believes that this is a key component in his training as it promotes open communication between departments and eliminates silos. EVERYTHING DISC® IS THE MOST IN-DEPTH AND EASILY CUSTOMIZABLE DISC-BASED TRAINING SOLUTION AVAILABLE. Mike Mack is an award-winning Authorized Partner for Everything DiSC® programs. Everything DiSC® Workplace is round table training that uses online pre-work, engaging facilitation with contemporary video, and online follow-up to create a personalized learning experience. Everything DiSC Work of Leaders® is classroom training that focuses on Vision, Alignment and Execution. Based on best practices, Work of Leaders connects unique leadership styles to real-world demands, generating powerful conversations that provide a clear path for action. Watch the video below to learn more about DiSC. Mike Mack is an Authorized Partner for The Five Behaviours of a Cohesive Team™. His professional facilitation will give your organizations’s team the training and tools necessary to benefit from true teamwork and the ultimate competitive advantage it provides. Businesses that embrace the program can see increased profitability, heightened customer service, improved reputation, and many more tangible benefits. 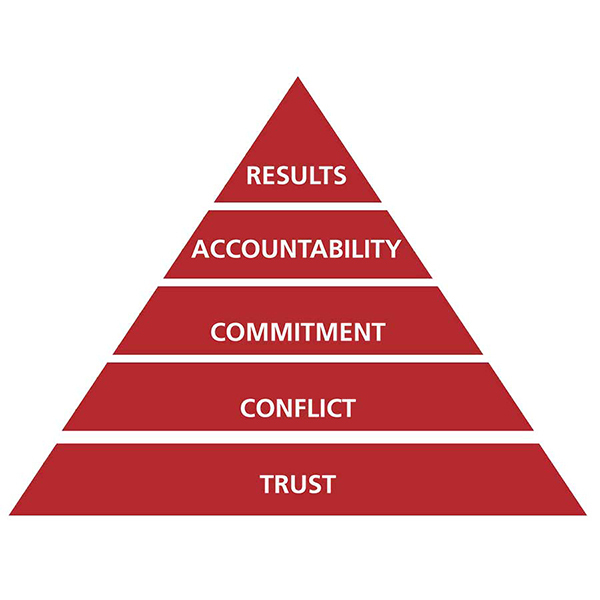 Developed with Patrick Lencioni (The New York Times best-selling author), The Five Behaviours of a Cohesive Team™ has become the industry-leading workplace training proven to deliver business results. Get more information by contacting our team today to schedule a conversation. Watch the video below to learn more about The Five Behaviours of a Cohesive Team. Does your team need training on Sales or Customer Service? Mike Mack offers tailored sales workshops and training opportunities to help your team reach its sales goals and improve sales processes. He offers fun and interactive half and full-day sessions or weekend retreats. The customer service training offered by Mike Mack will help ensure you keep your customers satisfied and attract others by maintaining a positive reputation. How effective is your team at ensuring your customers are always happy? Knowing how to keep your customers happy and avoid complaints (even the unspoken ones) is crucial to any business’ success. Mike Mack has helped many businesses improve their customer service performance. Learn more about our Customer Service Workshops. Mike has facilitated many strategic planning sessions for organizations and companies. Several themes exist for these sessions including strategic growth planning, team goal setting, succession planning, and leadership or communication management. A consistent challenge for organizations is taking the time to collaborate, get input from all organization members, and share important information amongst their teams. Strategic planning should represent an opportunity to discuss current issues, reflect on successes and challenges as well as ensure your team is well informed moving forward. Mike can help your organization further the development of your strategic direction. He will conduct individual discussions with key leadership team-members and facilitate interactive activities and roundtable discussions where all participants will collaborate, share information, and strategize on key initiatives. Mike will then assist your business in formulating an action plan that ensures the buy-in of all team members, aligns all of the moving parts of the business, and establishes appropriate accountability, ensuring flawless execution that brings about the desired results. Mike is also a TEC Canada speaker and feels privileged to be part of this elite group of business leaders and executives.